According to the PEW Research Center, there are no states with a significant Orthodox Christian population. Editorial credit: Todd A. Merport / Shutterstock.com. 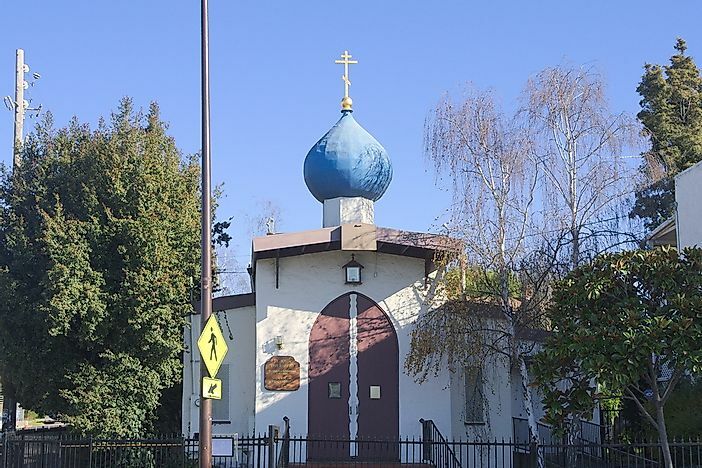 A Baptist Russian Orthodox Church in Berkeley, California. Christianity is the dominant religion in the United States accounting for about 70% of the religious population. Orthodoxy is one of the Christian denominations practiced in the US and around the world. As per the history of religions, Orthodoxy is recorded among the earliest religions to be practiced in the world. The religion began in the Roman Empire and spread to other parts of the world as time went by. However, in the USA, the religion is still taking ground with only a small section of the entire population subscribing to the faith. This is clearly conveyed by statistical data presented by the PEW Research Center which shows that 49 of the 50 states have Orthodox populations of 1% or less of the state population. Alaska is the only state with any sort of significant population at 5%. Alaska has the largest Orthodox population by percentage of the state population at 5%. This is due to Alaska's settlement by Russian traders in the 18th century. Missionaries of the Russian Orthodox faith were sent to establish a formal mission in the settlement in the 1790s. Saint Innocent of Alaska served as the first bishop of the diocese and many Alaskan natives were converted to Orthodoxy. The headquarters were later moved to California and then to New York. California is the most populous state among the fifty states of the USA. It is home to the largest number of Orthodox Christians. However, this number is still so small that it is almost insignificant when compared to the entire USA population. The number totals to 1% of the state's entire population. The major groups associating with this religion are Russian Americans, Greek Americans, and Arab Americans. There are approximately 7 million Orthodox Americans. Although it is one of the world's oldest religions, it seems to be gaining ground at a very gradual rate in the US. Members adhere to different branches including Greek Orthodox, Russian Orthodox, Ukranian Orthodox, and Albanian Orthodox among many others.